I was probably 17 when I started thinking about what I wanted for my first tattoo. I had floral ideas, and handwritten ideas, and nostalgic-memorial-type ideas. I'll be honest, I even toyed with the idea of getting a lyric of one of my favorite songs. Which is way embarrassing when you know the song. Well, my 18th birthday came and went, and I didn't get a tattoo. Actually, I got my tragus pierced instead, about two weeks before I graduated high school. But, nothing was really speaking to me. I wasn't feeling pulled to make a dramatic change. Then, I was very suddenly and decidedly single, wildly depressed, and spending a lot of time ogling tattoos on the internet. Enter: "it's time for a tattoo." And, if anyone is now feeling as though I got a tattoo for only one of the above reasons...buh bye. I got a tattoo because I wanted one. Because I wanted to put something on my body that meant something really wonderful to me. I wanted one because I knew it would be beautiful. And I wanted one because 2017 gave me a freakin run for my money. So, I puffed myself up, shushed my fears, and sent the inquiry. 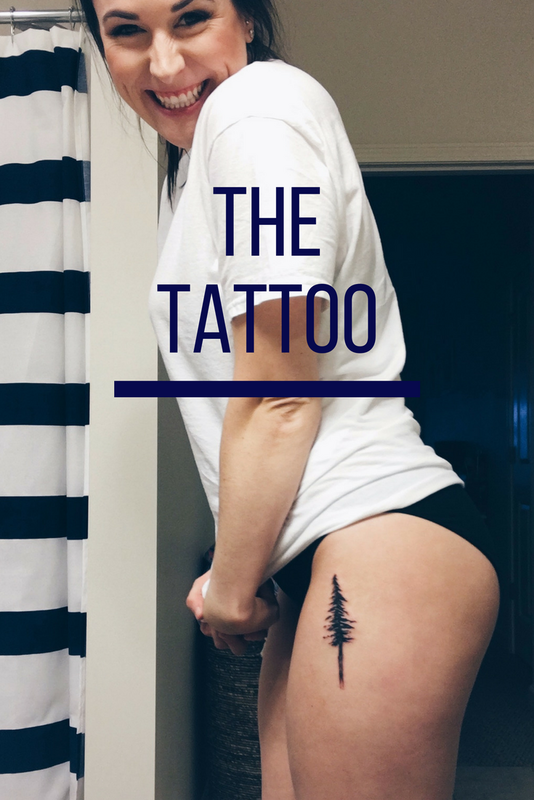 About a month later, I was laying down with my leggings around my knees, taking in one big deep breath before becoming someone who added something permanent to her body. Y'all had a lot of questions. Uh, no, not really. There were some points where it was more uncomfortable (think a long flu shot) for 3+ seconds. But by and large, no, it was not painful. It is on a pretty fatty part of my thigh. lol as if there are less fatty parts of my thigh. So, it really felt like a vibration that sometimes shot a quick pinch into my thigh. First of all, maybe don't ask that one with a condescending tone that also says, geez why would you do that? It means a lot of things. It means something for me to have gotten it in 2017. It has a lot of symbolism in the realm of strength and longevity. It also (obviously?) represents Vermont in lot of ways. Yes, that's the most basic of explanation. But also, the meaning really only has to be important to me. Where did I go and who did it? I went to Fortune Teller and Laura tattooed me - yes, I highly recommend her. Am I ready for my second one? Nope. I have heard that there is some tattoo-bug that'll bite me soon, but for now: nope. I am so happy with it. I am so pleased with how it looks, and where it is, and all parts of it. The tattoo and the healing process were so easy. And despite the fact that I was pretty sure that I was going to get cut out of the will when I told my parents, they even took it.....well.